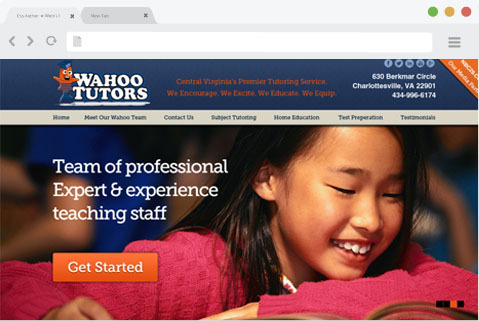 Wahoo Tutors is a small tutoring business located in Charlottesville, VA that has been around since early 2000. This prestigious organization is been providing subject tutoring and test prep courses to students ranging from K through college. We were proud to be selected to develop a powerful and scalable website for Wahoo Tutors that allowed us to show our creative and technical skills to the fullest. The old website was confusing to navigate, the design was outdated (created in 2000), and the owners were always dependent on their former website firm for any updates and changes that were necessary to the website. We started this project from scratch by carefully carrying out each phase of our web development and design process, from Wireframe, to Mockup, to Mobile Responsive Development. This project was a great success attributed to our agile team of designers and developers and responsive owners of Wahoo Tutors. Elements (call to action buttons, forms etc) of the website were strategically designed and placed to maximize the user experience for several user groups: Local Students, Parents, Potential Tutors and local school administrators. 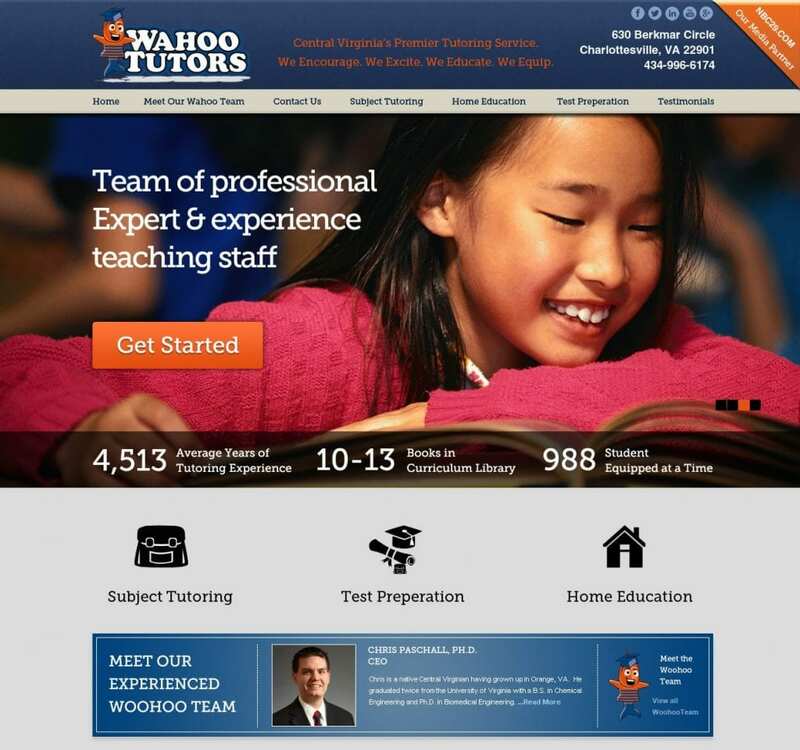 • Content Management System: We wanted to make sure that the staff members of Wahoo Tutors were able to easily manage and maintain the site. Along with that we wanted to use a backend platform that was scalable. Hence we chose WordPress as the Content Management System for Wahoo Tutors to manage the content on the website. • Mobile Responsive: With more and more customers now using mobile and tablet devices to browse the websites it was very important for us to develop a mobile responsive website as recommended by Google. We therefore developed a completely mobile responsive website that worked across all browsers and all different devices automatically. • Search Engine Optimized: Our standard protocol is to develop websites with in-built on-page search engine optimization. By choosing appropriate web page urls and using the power of images and content on various pages we were able to achieve all the on-page search engine optimization for the website. Along with that our SEO team was able to integrate and optimize the sitemap and robot.txt files to make it easy for the search engine to index the updated site. • Social Media Integration: Having target customers of tech and social media savvy students it was also very important for us to integrate social media networks into the new website that we designed. Taking that into consideration our designers strategically placed social media buttons to link the Facebook, Twitter, LinkedIn, YouTube and Google+ pages on the website to get the maximum exposure and at the same time does not hinder the conversion. • Lead Generation Forms Integration: The main goal for the website redesign was to increase the number of leads through the website. Our designers and developers developed and integrated lead generation forms and strategically designed them to increase the traffic conversion. We also integrated Google Analytics to track the website traffic and behavior to be used in future marketing campaigns. All-in-all the Wahoo Tutors Website Design project had been an amazing experience for the entire 99MediaLab team. Going through WahooTutors.com will let you know much more about the functionality of the website than you can see here.